Another day, another new band that deserves an exclamation mark after their name. Call me a huge pedant, but a surprise doesn’t feel surprising unless there’s the relevant punctuation to ram home the shock. Such are the myriad nuances of life. More Than Cool is exactly not that: endearing, warm and welcoming in approach, satisfyingly crunchy and brief in function. 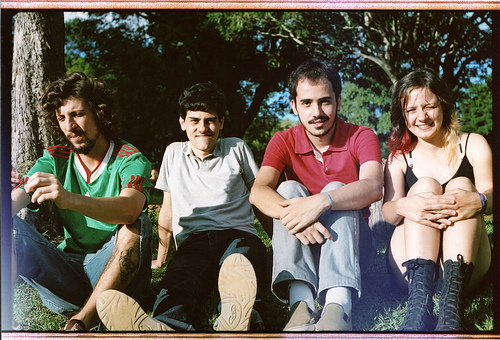 Top Surprise are from Brazil – a country about whose music scene I know very little, but am spurred on to investigate further with each excellent release that shimmies forth, happy, sunny and anxious to please. Similarly, I know very little about Top Surprise, but am willing to make these simple judgements from theirs songs and their rather endearing photo: They are nice people who make nice music. In an ‘industry’ awash with poseurs and cynicism, perhaps that’s the real shocker. Posted on August 6, 2010 by Joe Sparrow. This entry was posted in Headline, Today's New Band and tagged nice, simple sounds. Bookmark the permalink. Another great find lovin the top surprise! The View From… Brazil | A New Band A Day!